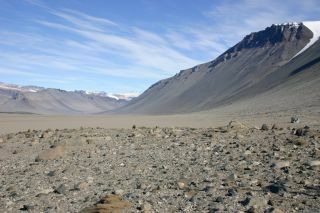 Wright Valley, one of the McMurdo Dry Valleys in Antarctica, where a type of extremophile cyanobacteria known as hypoliths live. The survival tricks adopted by microbes known as hypolithic cyanobacteria, which are found underneath quartz rocks in Earth's deserts, could point to how microbial life on Mars may live, a recent study suggests. Underneath the quartz rocks that litter these valleys, small communities of bacteria eke out an existence. These photosynthetic cyanobacteria are called hypoliths, and they have adapted to conditions too harsh for most other organisms. Known as extremophiles, these microbes sketch the outer limits at which life can exist and are found in deserts around the world. In a paper published last year in the journal Frontiers of Microbiology, Pointing and his colleagues sampled hypolithic cyanobacteria from deserts on each of the globe's continents. They found that desert conditions are variable enough that certain genera of cyanobacteria flourish in some deserts, but not in others. Some deserts, for example, have rare, extreme rainfall, while others have consistent overnight fog that introduces water into the ecosystems. Hypolithic cyanobacteria occupy a niche in desert ecosystems. The quartz rock they live under lets some light in, but protects them from potentially damaging ultraviolet radiation. Because they photosynthesize, these bacteria are a major source of biomass in deserts, making them the foundation of the ecosystem's food chain. "If we can understand how these hypolithic communities survive in these harsh environments, it may provide a view on how likely we can detect life on other planets," said study lead author Donnabella Lacap-Bugler, a microbiologist at the Auckland University of Technology in New Zealand. An example of hypolithic cyanobacteria on a quartzite rock found in the Namib Desert in Namibia. From the scorching heat of Death Valley in California to the freezing reaches of Antarctica, the team collected a total of 64 hypolithic communities to see if their composition differed between deserts — and they did. "Although cyanobacteria are ubiquitous in the hypolithic communities in different deserts, there are genera that are more dominant than others," Lacap-Bugler said. "Cold deserts like the Antarctic and Tibetan deserts will tend to have a higher abundance of filamentous cyanobacteria, called Phormidium." Phormidium is a type of cyanobacteria which, under a microscope, looks like short strands of spaghetti. Members of this genus can exploit habitats that cycle between short periods favorable to growth and dry periods that send them into an inactive state, much like hibernation, until the next growth phase begins. Phormidium does well in places like the McMurdo Dry Valleys, where long, dry periods of extreme cold are followed by warmer phases of flushing water from ice melt. In hot deserts, though, Chroococcidiopsis is more abundant, Lacap-Bugler said. This photosynthesizing microbe resembles a small Brussels sprout, and in a community, individuals cluster together in lumpy green balls. Chroococcidiopsis survives the baking heat of hot deserts by secreting water-absorbing molecules that coat its cells as a way to hang onto moisture. "This is why Chroococcidiopsis thrives in deserts where fog or other small but regular moisture inputs are typical," Pointing says. Although these bacteria are suited to hot deserts on Earth, they are the better analog for life on Mars, Pointing says. Mars may be very cold, but it also lacks a global magnetic field and thick atmosphere to rebuff the onslaught of solar radiation. Chroococcidiopsis' strategy to retain moisture also protects it from high levels of radiation. "This would be an absolute necessity on Mars' surface, since radiation levels are high," Pointing said. This research was funded by the NASA's Astrobiology Science and Technology for Exploring Planets program (ASTEP).